Keywords: Skin stretching; Lip plates; Skin modification; lip stretching; beauty; Mursi. Our skin can serve as a reflection of our personality, beliefs, or values and in some cases as medium by which to express self-esteem, beauty, and power. Skin stretching has become immensely popular in North America as a form of self-expression. Many examples can be found throughout pop culture, for example in the recent Marvel blockbuster film Black Panther. Several cast members are portrayed with lip plates, cosmetics, tattoos, and even scarification, likely as a sign of power, resilience, and a homage to African culture and beauty. As dermatologists, we should be aware of the significance of this form of body modification as it relates to the individual. Pitts-Taylor V. Cultural Encyclopedia of the Body. A-L. Westport, CT: Greenwood Press; 2008. Hawass ZA.The Golden Age of Tutankhamun: Divine Might and Splendor in the New Kingdom. Cairo: American University in Cairo Press; 2004. Lip-plates. Mursi Online. 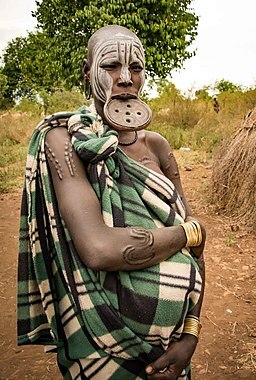 http://www.mursi.org/introducing-the-mursi/Body Decoration/lip-plates. Published April 16, 2017. Accessed April 15, 2018. This entry was posted in Jorge Roman, Kevin Cao, Tyler Marion, UTMB and tagged beauty, Lip plates, lip stretching, Mursi, Skin modification, Skin stretching by Tyler Marion. Bookmark the permalink.